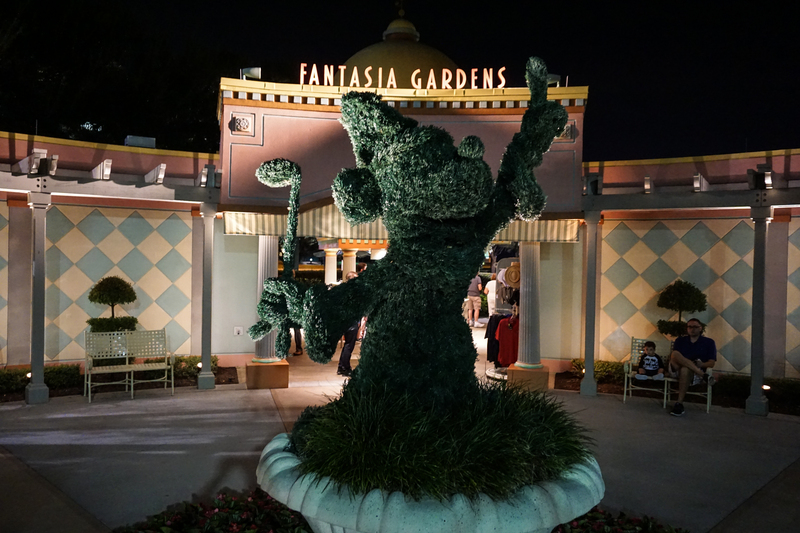 This is the final post for our lovely week at Disney World, our honeymoon vacation. As you have read, it was a magical week. Our final days contained what was perhaps our most special events out of the entire trip. After our time at Universal Studios on Saturday, we returned to our room at the Wilderness Lodge eager to rejoin the Disney experience. Their attention to detail and high level of customer service was truly missed during our off-property experience. While Samantha napped, I wandered around the lodge with my camera. The lobby is very comforting for me, and I really enjoyed my time sitting by the giant fireplace as I rocked in a chair, listening to the dull cacophony from the nearby restaurant. When dinner time rolled around, we headed for the monorail. 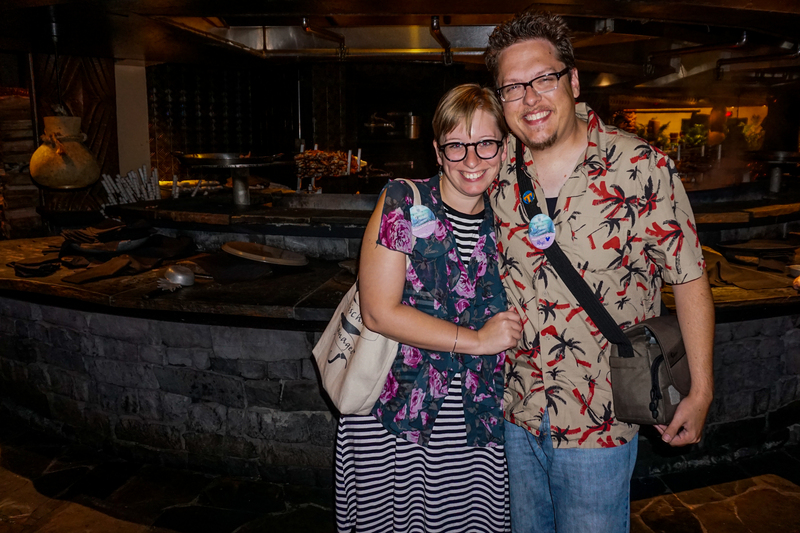 Dinner reservations had been made at ‘Ohana, the restaurant at the Polynesian Resort. The Polynesian is one of Disney’s oldest resorts, though that doesn’t mean it feels outdated. It, too, had a very comfortable atmosphere as we waited our turn to be seated at the popular family-style dining destination. We enjoyed a very filling (all-you-can-eat) meal of various skewered meats while watching the sunset over the lake, Cinderella’s castle in the distnace. A Hawaiian woman played the ukulele while wandering the dining area, occasionally teaching folks how to say certain words in her native language. Samantha was smitten with their salad while I gorged myself on their delicious charred chicken and steak. I did try a bite of their bananas foster for dessert, but returned to my carnivorous ways until I was truly stuffed. After dinner, we made use of another one of our coupons and played mini-golf. A course next to the Swan Resort is themed after the film ‘Fantasia’ and we took a bus over to enjoy 18 holes of what turned out to be a very fun course. Getting to walk through the grounds of the Swan was an added bonus; it was the resort I stayed at on my last visit in the mid-nineties. I can’t say if a lot has changed much or not, as I was curiously unable to remember what the interior of the hotel looked like. I can tell you that it’s obvious that the resorts were NOT designed by Disney; they have a lot of nice touches, but it’s nothing like walking through the Grand Floridian or the Wilderness Lodge. 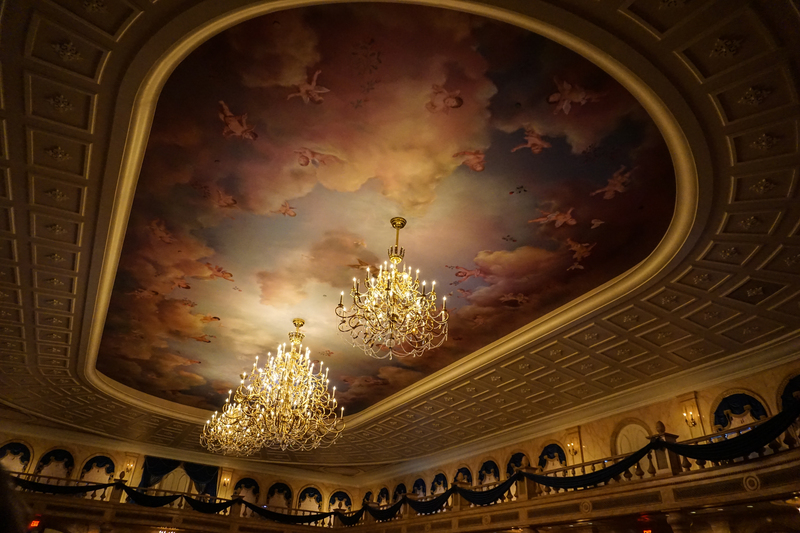 Sunday, our final day, had no set itinerary aside from dinner reservations at ‘Be Our Guest’, the notoriously hard-to-get dining destination themed from Beauty and the Beast. Since that was at the Magic Kingdom, and we had a few rides we hadn’t yet experienced, we decided to make a day of it and fill in our gaps. 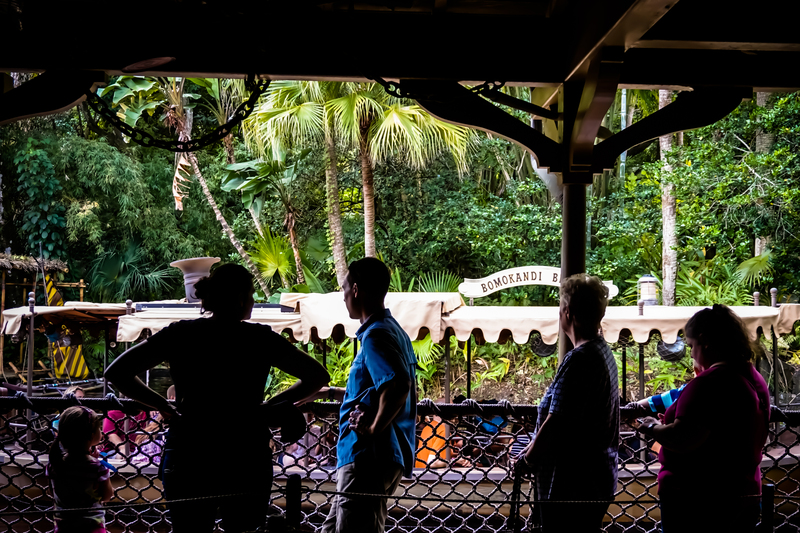 Our first stop was the Jungle Cruise, which I had forgotten is COMPLETELY FILLED WITH PUNS. I got ‘The Look’ from Sam even though I said nothing; it was assumed I did this on purpose. It was interesting to travel through the area that’s themed after Angkor Wat in Cambodia, as that was one of my favorite destinations abroad. We also took a spin on Dumbo, which now sports two separate rides and a unique queue experience. Halfway through the line, there’s a large play area. You’re given a beeper (like in a restaurant) and you wait there; kids get to run and play instead of stand and wait. It’s pretty genius, actually. OH – and we did finally get to ride the Seven Dwarfs Mine Train coaster. It’s about the same intensity as Thunder Mountain, but contains next generation animatronics and has an excellent vibe. I’m glad we waited in line for it! ‘Be Our Guest’ was exquisite. After you enter the doors to the castle, there are three dining areas: the Grand Ballroom, the West Wing (not from the White House, but where Beast’s study is…complete with red rose and slashed portrait), and the Castle Gallery. We were seated in the Grand Ballroom, which features a few amazing chandeliers and a wall of windows designed to replicate the snowy French mountainside. As we were being seated, the couple at the table next to our got engaged; it was very sweet. The food was terrific; as a bonus, Beast would occasionally walk through the dining hall to the delight of everyone inside. For being honeymooners, we were gifted a small bit of The Grey Stuff (which was, indeed, delicious). It was one of my favorite dining experiences of the entire weekend. The only remaining event we had was the morning of our departure. Every morning, the Wilderness Lodge has a flag raising ceremony on the roof of the building. In a tradition that mirrors their Yellowstone National Park inspiration, a family can join the Head Ranger to participate. When we had arrived on the 12th, we asked if any days were still available. Although this is an unadvertised bit of Disney magic, there is only one slot per day; it’s booked up quickly. Luckily, a single day was still open…our final one at the lodge. We met Ranger Jack at the front desk at 7:30 AM, where he gave us the five flags that we would be raising high above the resort. 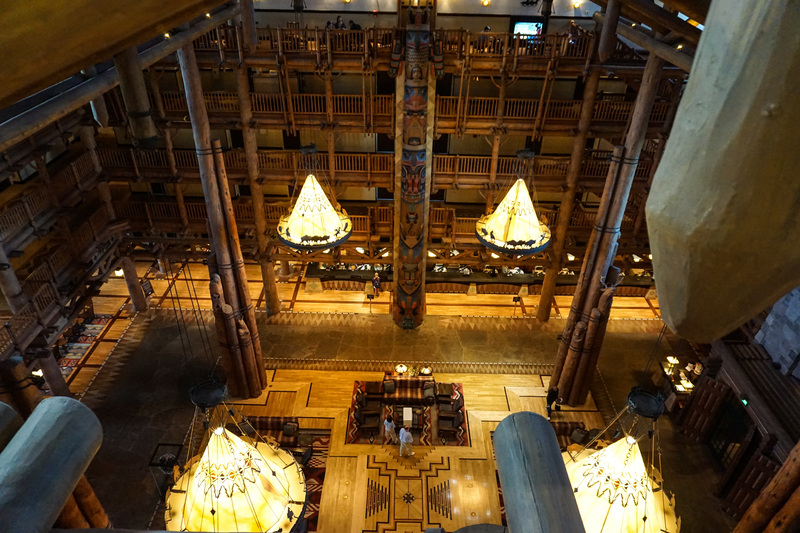 As we took the elevator to the top floor and stairs to the roof, he told us a bit about the history of the lodge, the specific inspirations behind the design, and the materials used to replicate (or simulate, in some cases) the National Park vibe of the place. Once on top of the Wilderness Lodge, we were treated to a stunning sunrise and more historical context. The Magic Kingdom sits next to a man-made lake, which is adjacent to an actual lake. The whole place was designed as an ‘escape’ from the real world. The parking lot is deliberately detached from everything to help with that escape, providing a secluded place for families to revel in a fantasy world. The man-made portion was designed in part by a general that helped build the Panama Canal! 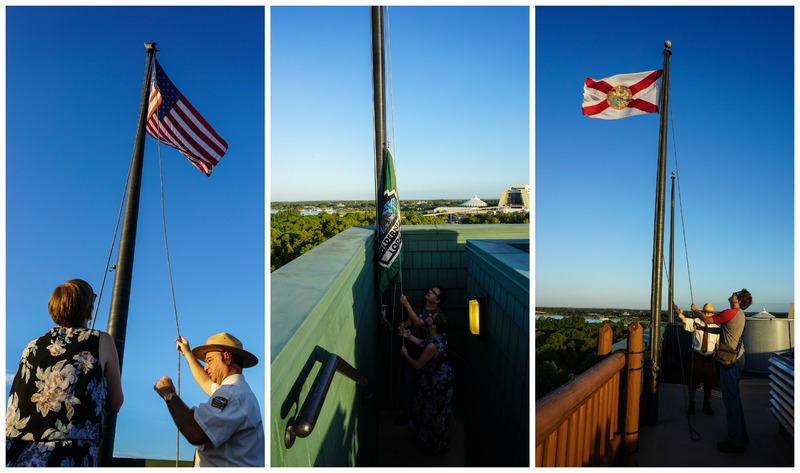 The five flags we raised were: the American Flag, the Florida State Flag, the Disney Flag, the Adventurers Club Flag, and the Wilderness Lodge Flag. Watching the sunlight wash over the Magic Kingdom was the perfect way to end our time at Disney World. Now that we’re home, life is slowly returning to normal. All of our chores awaited us upon our return, as did our jobs. I have to get the gutter repaired, Sam’s car needs an oil change, and I need to start preparing for my next big thing: an art showing! I’ll have a formal announcement once we get closer, but I will have an exhibition of my photography in early December right here in Tulsa, off of the original alignment of Route 66! I’m super excited and can’t wait. Thank you all so much for following this most personal series of travel updates; I’m already wondering where my next road trip will take me! This entry was posted in Uncategorized and tagged be our guest, Disney, Disney World, honeymoon, Magic Kingdom, ohana, WDW, Wilderness Lodge. Bookmark the permalink.